The combined might of the independent labels is the biggest player in the US recorded music market – and growing fast. According to new stats from Nielsen/Billboard, the independents took 35.4% of the US market by ownership (volume) in the first half of 2015. That was comfortably ahead of Universal (27.6%), Sony (20.9%) and Warner (15.2%), and represented an increase on the 35.1% share the indies claimed across the whole of 2014. Indie label trade body A2IM has trumpeted the numbers online, calling market share by ownership ‘the only appropriate market share definition’. This is the metric that re-apportions market share taken by albums which are owned by independent labels but distributed by majors – the most obvious example being Taylor Swift, whose catalogue is owned by Big Machine but distributed by UMG. These numbers are nominally for ‘albums’ but also takes into account TEA (Track Equivalent Albums) – meaning they also represent popularity on download stores. 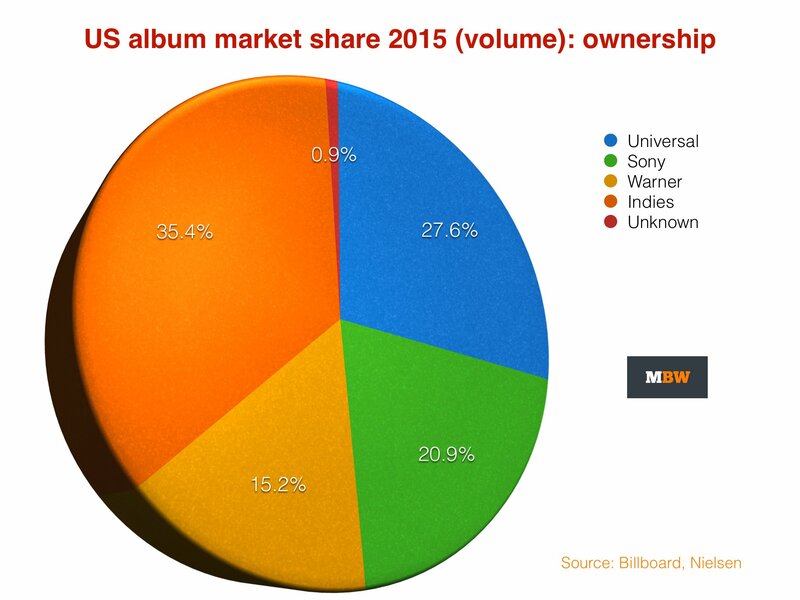 In terms of distribution market share, Universal took 39.2% of the market in H1 2015, followed by Sony on 27.6%. Warner claimed 19.2% of the market under this measurement. The indies followed on 13.1% – highlighting just how much these companies in the US rely on the majors, like Sony’s Red, Warner’s ADA and UMG’s Caroline, for their distribution power. As previously reported, album sales in the US – real album sales, removing SEA and TEA – fell 4% by volume in the first half of 2015.